A Tuscan dining room…..with rust red walls. Comfort basks this surround. We have chosen dark, masculine Tuscany furniture for this space. Warm lighting beams and showcases the important areas in this room. 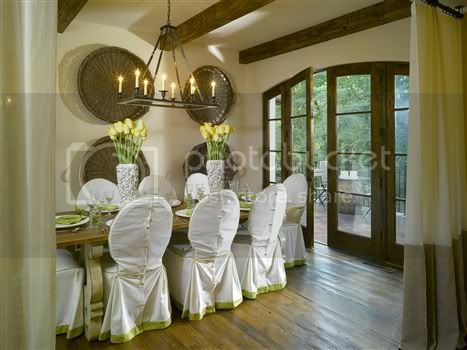 Tuscan sconces are the wrought iron light fixtures for this room. This adds a nice effect with the furniture selection in this style. In the day, as well as evening, the lighting shines a beautiful white with orange-red outline in this Tuscan diningroom . The table is shiny and stained. On the top surface, we have a beautiful ornate table mirror that bounces a radiant reflection of light from the adjacent chandelier. Hard wood floors are dominant, but is quieted by an attractive area rug placed underneath the dining table. What’s next for Tuscan dining room decorating? Want more Tuscan style dining room ideas? Sign up for Tuscan Designer, our free eNewsletter.